First line: "DATELINE: Banesville, NY, May 3rd. Bonnie Sue Bomgartner, Banesville's soon-to-be 67th Apple Blossom Queen, let loose a stream of projectile vomiting in the high school cafeteria." Sixteen year-old Hildy Biddle dreams of being a stellar journalist. She's the star writer for her high school newspaper in the small, sleepy farming town of Banesville, NY. I must admit I very nearly put this book in my "Did Not Finish" pile in the first few pages. The book opens with a prolonged description of the Apple Valley Pageant Queen vomiting, which went on for far too long and with far too much detail. That, plus the fast-paced, noir-inspired, witty banter that Hildy uses initially felt a bit forced - she was trying too hard to sound like Sam Spade. But, I stuck with it, and things picked up from there. Hildy reminded me a lot of Veronica Mars... bold, inquisitive and skeptical, and fairly negative on the whole idea of dating. Ever since the recent death of her father, also a reporter, she's been living with her mother and cousin and grandparents. The local paper, The Bee, starts printing more and more outrageous stories, claiming there's a ghost haunting the old Ludlow place, creating fear and panic in the town. With the help of her experienced newsman mentor Baker Polton, she sleuths out the clues that lead to the real reason behind the hauntings. 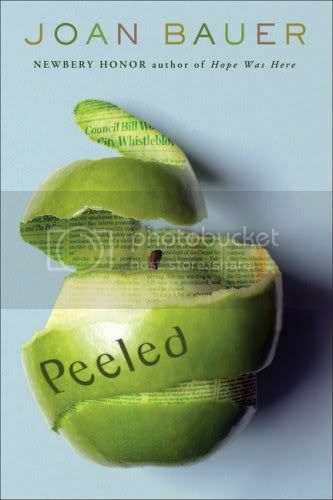 When the school shuts down the school paper, The Core, she and her friends start a rebel sheet called The Peel. "You mean the editor of The Bee faked all the ghost sightings to lower property values in town so he could build a new development?" "And we would have gotten away with it, too, if it weren't for you meddling kids!" This was a fast-paced enjoyable read, a solid pick for younger teens, and the perfect book for YA readers looking for non-fantasy realistic fiction without too much emphasis on romance. I'd actually recommend this as a great introduction to Joan Bauer. If readers like this, they'll love the much-stronger Hope Was Here.